Our innovative, projection-based method delivers exceptional CT image quality. MAR is designed to reveal anatomic details obscured by metal artifacts, helping clinicians utilize CT scans, diagnose disease and contour targets with greater confidence. 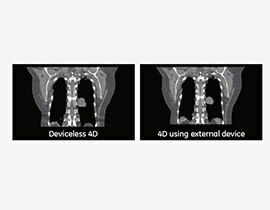 Based on the latest in GE Healthcare smart technology, MAR uses an automated, three-stage projection based process to help improve the quality of CT data within the projection space, rather than in image space. This innovative, projection-based method helps to reduce photon starvation, beam hardening and streak artifacts caused by metal in the body, such as hip implants, spine screws and dental fillings. Streamlined workflow for patient comfort. Our metal artifact correction technology uses an automated, three-stage projection based process to help improve the quality of CT data within the projection space, rather than in image space. This projection space correction leads to images that are consistent with the uncorrected image and of exceptional image quality.